Rich Christian, Poor Christian: How To Enjoy A Guilt Free Good Life! I have awesome news for you, today. God wants you to enjoy life! Now, how cool is that? Unfortunately, though, I think many Christians have this misguided view that Christianity needs to be some super-serious, no joking around, kind of life. And, I get that. My own personality can tend to be pretty serious on a regular basis. I'm wired that way. While there are serious aspects to the Christian life, I have doubts that the Lord has ever desired His followers to be walking around this world looking like we've been sucking on lemons all day - you know, with a sour "pucker face." If, as Christians, we're supposed to have an unspeakable joy in our lives, but don't demonstrate that, why would unbelievers even be attracted to our faith in the first place! I know that there is nothing better for them than to rejoice and enjoy the good life. It is also the gift of God whenever anyone eats, drinks, and enjoys all his efforts. I know that all God does will last forever; there is no adding to it or taking from it. God works so that people will be in awe of Him (HCSB). In the above verses, we clearly see that enjoying the good life is a gift from God. 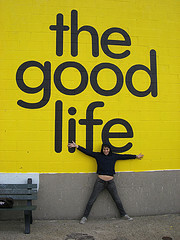 And, because the good life is a gift from God, we should live that good life joyfully, free from any guilt! God is okay with it. Yes, we have an awesome home waiting for us in heaven. Yes, God wants us to be pursuing His will in our lives. And, yes, God wants us to be living out holy lives before Him. But that doesn't mean we can't enjoy our time on planet Earth while we are here. He loves you so much that He has given you this special gift. Accept His gift with thanksgiving and praise! So, if you have the opportunity to take your family to Disney World, then take 'em to see Mickey and have a blast. Laugh, have fun, and enjoy yourself! If you have the means to be able to take your spouse on a once-in-a-lifetime trip to the city of love, Paris, France, then jet over there and have the romantic time of your life! But also, don't forget the little joys in this life that don't cost a lot of time or money. The laughter and joy of seeing your kids or grandchildren playing on the soccer field. The ability to work hard at something you love to do. The embrace of your mom and dad. Fishing on a lazy Saturday morning. Playing a musical instrument. I could list hundreds of examples of the simple things in this life that can bring a smile to your face. In whatever you find joy in this life, embrace it. Life is a journey, so enjoy the ride!